Yesterday Govt issued a statement in newspapers that there are no prisoners in Punjab jails who have completed their terms and that life term means life long ones. But some awake Sikhs have exploded the myth of misleading statement of the Govt. The Govt has said that how could they free a person who has been awarded life imprisonment. The Sikhs have come up with facts where even killer of innocent people who was awarded life imprisonment has been set free after 8 years. According to the Punjab government, they have met with the Minister for Home Affairs and written to their counterparts in other States, to seek the release of Sikh political prisoners who have served more than the minimum term. 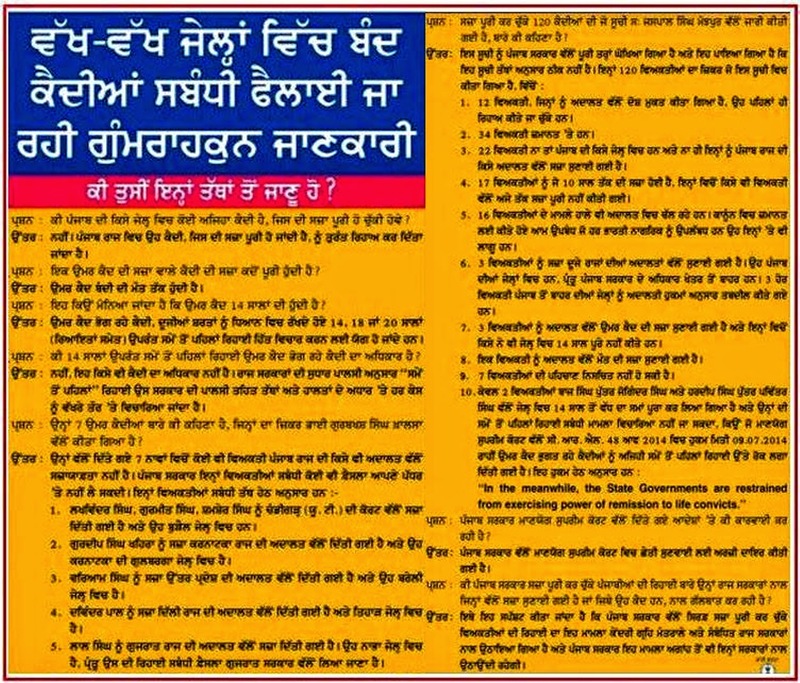 Yet despite all they have said and done, today they published adverts in Punjab’s leading newspapers, in their own words: ‘to dispel the myths surrounding the issue of Sikh political prisoners’. 2. The Punjab government stressed, life imprisonment means ‘for life’. 3. Life-term prisoners are eligible to be considered for release depending on certain requirements, after they have served a minimum term of 14, 18 or 20 years. 4. It is not a ‘given’ that the prisoner will be prematurely released but rather, State governments can grant premature release at their discretion on the basis of rehabilitation and each case is examined upon its merits. 5. The Punjab government states they don’t have the power to release the 7 Singh’s Gurbaksh Singh Khalsa is campaigning for; Gurmeet Singh, Shamsher Singh & Lakhwinder Singh fall under the jurisdiction of Chandigarh, Varyaam Singh is under Uttar Pardesh, Gurdeep Singh Khaira is under Karnataka, Lal Singh is under Gujarat and Professor Bhullar is under the control of the Delhi state government. 6. The Punjab government apparently ‘analysed’ the one year old tentative list, compiled by Advocate Jaspal Singh Manjhpur of 120 Sikh political prisoners, and pulled it apart saying it was factually incorrect. The government did however concede there are in fact 2 prisoners Baaz Singh and Hardeep Singh (2 of the 7 prisoners in Punjab’s jails who have completed their minimum terms, whose cases were reported by Sikh Relief last month). This is an alarming contradiction to the governments claims made in point one - “there are no prisoners in Punjab who have served their sentences, waiting to be released. In Punjab, any such prisoners are released without delay.” The government’s excuse in answer to this - “we are restrained from exercising power of remission of life convicts under the 2014 Supreme Court ruling”. 7. The advert ends by vowing that the Punjab government will ‘soon’ file an application in the Supreme Court of India against the restraining order issued to the States. Badal’s government promises to ‘continue raising’ the issue of Sikh prisoners with the Centre and other State governments concerned. It is clear, the Badal government denies to recognise the ‘political’ status of these Sikh prisoners and deals with the issue as if it were ordinary prisoners requiring only legal considerations. By taking a political approach to the issue, legal avenues can be found. In India, it is theoretically correct that a life sentence means entire ‘life’. However, as reaffirmed by the Punjab government in their advert, the State does have the prerogative to grant early release to those who have completed their minimum mandatory sentence, but why is it not being exercised to release Sikh political prisoners? Instead, eligible Sikh political prisoners are denied their RIGHT to have their cases considered for early release without discrimination. The government also fails to explain, how ex-Inspector Gurmeet Pinky was released after serving only 8 years of a life sentence? How DSP Swaran Dass was released after serving only 5 years of a life sentence? If life means life, how is one set of law applied to Sikhs who cannot even be released after serving over 25 years and another law applied to human rights abuser cops? The advert openly belittles the work of human rights lawyer, Jaspal Singh Manjhpur, in compiling an ever changing list of Sikh political prisoners. By using a year old version and stating the whole 120 prisoners on the list are names of those who have completed their minimum sentences, they have indulged in wrongful propaganda. Advocate Manjhpur has made several updated versions of the original list and clearly sets out the different categories of prisoner. Manjhpur says, “they are using the older list irresponsibly without consulting me” and he has issued an open letter in response, which sends a fitting reply to the governments claims. Clearly, the government has used the advert to send out misinformation. For example, Baaz Singh, Hardeep Singh, Dilbagh Singh and Swaran Singh are in Punjab’s jails and had completed their minimum sentences BEFORE the Supreme Court stay came into force. In Baaz Singh’s case he should have been considered for early release SIX YEARS before the Supreme Court order of July 2014. Yet, the Punjab government claims to release any such prisoners “without delay”! The Punjab government hides behind the Supreme Court order restraining their use of remission, but there is no such bar on granting other relief. Other options available are: reprieve, pardon, suspension and commutation of sentence. At the very least, are Sikh political prisoners not entitled to regular parole leave as granted to others? The problem is the “lack of political will” to solve this issue. ਸਰਕਾਰ ਮੁਤਾਬਕ ਜੇ ਉਮਰ ਕੈਦ ਦਾ ਮਤਲਬ ਉਮਰ ਕੈਦ ਹੈ ਤਾਂ ਉਮਰ ਕੈਦੀ ਇੰਸਪੈਕਟਰ ਗੁਰਮੀਤ ਪਿੰਕੀ ਦੀ ਉਮਰ ਕੈਦ ੮ ਸਾਲ ਤੋਂ ਵੀ ਘੱਟ ਕਿਵੇਂ ਰਹਿ ਗਈ ਅਤੇ ਉਮਰ ਕੈਦੀ ਡੀ.ਐੱਸ.ਪੀ ਸਵਰਨ ਦਾਸ ੫ ਸਾਲ ਬਾਅਦ ਆਪਣੀ ਅਪੀਲ ਹਾਈ ਕੋਰਟ ਵਿਚ ਵਿਚਾਰ ਅਧੀਨ ਹੋਣ ਦੇ ਬਾਵਜੂਦ ਰਿਹਾਆ ਕਿਵੇਂ ਹੋ ਗਿਆ ਅਤੇ ਡੀ.ਐੱਸ.ਪੀ ਜਸਪਾਲ ਸਿੰਘ ਹੋਈ ੭ ਸਾਲ ਦੀ ਸਜ਼ਾ ਵਿਚੋਂ ਕੇਵਲ ੧ ਸਾਲ ੮ ਮਹੀਨੇ ਕੈਦ ਕੱਟਣ ਤੋਂ ਬਾਅਦ ਤੇ ਹਾਈ ਕੋਰਟ ਵਿਚ ਅਪੀਲ ਲੱਗੀ ਹੋਣ ਦੇ ਬਾਵਜੂਦ ਰਿਹਾਅ ਹੀ ਨਹੀਂ ਸਗੋਂ ਉਸਦੀ ਨੌਕਰੀ ਵੀ ਬਹਾਲ ਕਿਵੇਂ ਹੋ ਗਈ? ਕਲਕੱਤੇ ਵਿਚ ਜਾ ਕੇ ਝੂਠਾ ਪੁਲਿਸ ਮੁਕਾਬਲਾ ਬਣਾਉਂਣ ਵਾਲੇ ਪੁਲਿਸ ਅਫਸਰ ਦੀਆਂ ਉਮਰ ਕੈਦਾਂ ਕਿਵੇ ਪੂਰੀਆਂ ਹੋ ਗਈਆਂ ?